Kane Hemmings' late penalty pegged back Motherwell and salvaged a point for Dundee at Dens Park. 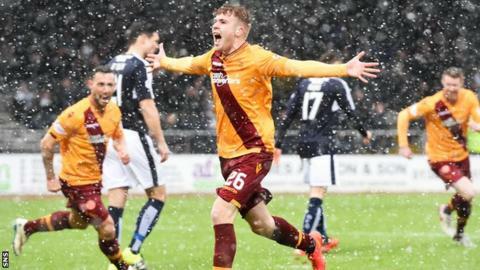 Chris Cadden finished Marvin Johnson's cross to hand Motherwell an early lead, but Paul McGowan's first goal of the season soon cancelled it out. Stephen Pearson again nudged the visitors ahead with a brilliant solo effort before half-time. But Hemmings' spot kick with less than five minutes of normal time remaining rescued Paul Hartley's side. The result moves the hosts back above Inverness Caledonian Thistle into the Premiership's top six, while Motherwell slip to ninth. The strengths and weaknesses of Dundee were neatly summed up in a the space of just a couple of minutes at the start of this game. Cadden scored a terrific first-ever goal for Motherwell when the unmarked teenager controlled Johnson's cross on his chest before guiding the ball into the top corner of the net. That makes it just one clean sheet in 18 games now for Hartley's team but they quickly reiterated how impressive they are going forward. Great play by Greg Stewart released McGowan in the inside right channel and he controlled the pass before hooking the ball home. Both strikes came in the first seven minutes and the only surprise was that it took until midway through the half for another to arrive in an open and entertaining match. Keith Lasley forced Scott Bain into a fine save to keep out the Motherwell captain's 35-yard free kick while at the other end Stewart and Gary Harkins tormented the visitors defence. It was Pearson who put the Steelmen back in front with another excellent goal in 23 minutes as the veteran midfielder burst through the Dundee defence before angling in his seventh goal of the campaign. Both Conor Ripley and Bain continued to make crucial saves as the sides created plenty of chances despite the fierce wind and snow flurries that contributed to the pitch cutting up badly. Dundee did dominate possession in the second half but Motherwell defended doggedly to limit their clear cut chances while trying to hit on the counterattack. The visitors did have the ball in the net on a quick break out but Louis Moult drifted offside before netting Pearson's through ball. But it was Cadden's challenge on Kevin Holt that led to Hemmings netting his 16th of the season from the spot - no more than Dundee deserved for their second-half supremacy - with substitute Arturo, the on-loan Spanish striker, almost snatching a winner. Match ends, Dundee 2, Motherwell 2. Second Half ends, Dundee 2, Motherwell 2. Attempt saved. Kane Hemmings (Dundee) right footed shot from the right side of the box is saved in the bottom left corner. Goal! Dundee 2, Motherwell 2. Kane Hemmings (Dundee) converts the penalty with a right footed shot to the bottom right corner. Penalty conceded by Chris Cadden (Motherwell) with a hand ball in the penalty area. Substitution, Dundee. Craig Wighton replaces Nick Ross. Josh Law (Motherwell) is shown the yellow card for a bad foul. Gary Harkins (Dundee) wins a free kick on the left wing. Substitution, Dundee. Arturo replaces Rory Loy. Attempt missed. Gary Harkins (Dundee) left footed shot from a difficult angle on the left is close, but misses to the left. Attempt saved. Marvin Johnson (Motherwell) left footed shot from outside the box is saved in the centre of the goal. Attempt missed. Gary Harkins (Dundee) right footed shot from the right side of the box misses to the left. Attempt blocked. Greg Stewart (Dundee) left footed shot from outside the box is blocked. Corner, Dundee. Conceded by Steven Hammell.